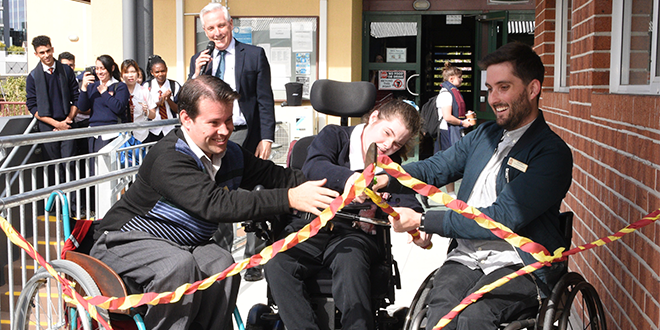 Easy access: Doing the honours at the opening of a walkway at St James College that will improve access for people with disability are (from left) Sam Hodge, Alexandra Murphy and Caleb Bull. Photo: St James College. HIGH school student Alexandra Murphy won’t be struggling to get to assembly after receiving a new shortcut from her college community. Alexandra, who lives with a severe degenerative disease that has confined her to a wheelchair, was among the first students to use the new walkway that connects the hall at St James College, Spring Hill, with the main classroom buildings. “I love the new walkway,” she said. “It makes it so much easier to get to school assembly now. The walkway will also give Alexandra and others in the school community with a disability easier access to the main classroom block and library from the college gates. Principal Gerry Crooks said Alexandra had been an inspiration to the school community since arriving at the college in 2014 as a Year 8 student. She helped cut the ribbon to mark the official opening of the walkway alongside college teacher aide Sam Hodge and young counselling intern Caleb Bull, who both have spina bifida. Mr Hodge said the new walkway delivered a clear message of inclusivity at St James’, and dubbed the new walkway “a stairway to heaven”. “The walkway gives me the chance to meet more of the school community more often, it connects everyone and I’m very proud to be a part of this very inclusive community of St James College,” he said. Mr Bull, who is in his final year of a Masters of Counselling at the University of Queensland and is on a 12-month internship at St James’, said the walkway would increase his engagement with students and staff. He said he was honoured to be part of the St James’ community. “Participating in the opening of the renovated path made me feel privileged to be part of a Catholic community that genuinely promotes tolerance and inclusivity for people with different abilities,” Mr Bull said. Mr Crooks said the school was committed to being an inclusive school. “The new stairs and walkway help to provide full disabled access across the school and have been welcomed as part of this school’s commitment to inclusivity,” Mr Crooks said. “I said to all the students when we did the ribbon-cutting, that it is often the little things that mean so much to us and epitomises our story as a school.